If you are like me, then you want awesome designer looking curtains for cheap and easy. 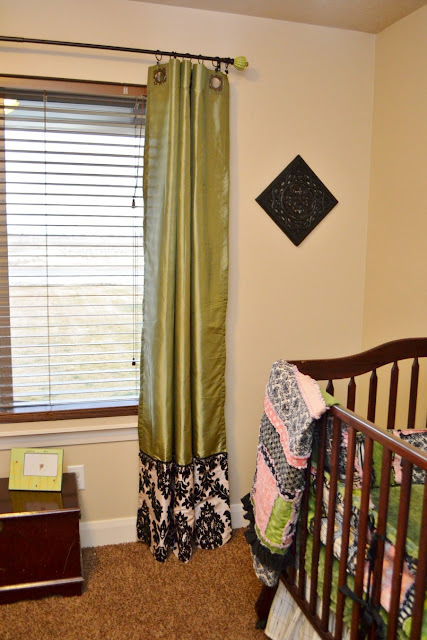 Its not difficult to find a decent set of plain curtain panels for under $10/panel, but the chances that the curtain is longer than 84 inches long or embellished how you want it to be is not good! This method is also great to color block curtains too! 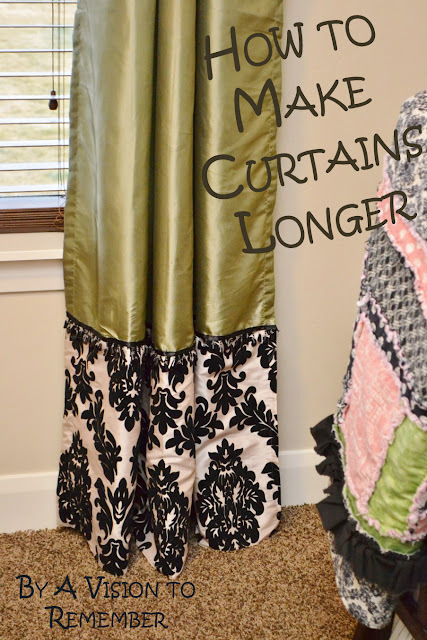 Today, I want to share with you how I make my curtains the custom length that I need and add a little trim to them to make them appear expensive and professional. The same method works great for shower curtains too! You can see the shower curtain I did for my Master Bathroom HERE. The green curtains I am using today I found at Ross's for $7.99/panel. Then I bought some home decor weight fabric to add onto each of the 2 panels. I got 1 yard. I also purchased enough of the bead trim to trim each of the panels going horizontally, plus a couple inches for each panel so that I can fold over the trim and not see the raw edges. Next, lay your curtain out with the right side facing up. Measure how far up you want the seam to be where the curtain meets your new fabric. Make sure when you are figuring out how long you want your curtain and how far down you need the new fabric to be to account for a seam allowance. I used a 1/2 inch seam allowance. Mark on the curtain with a fabric safe pen or marker where you want the seam to be. Flip over your new fabric. Next pin the right side of your curtain to the right side of your new fabric. 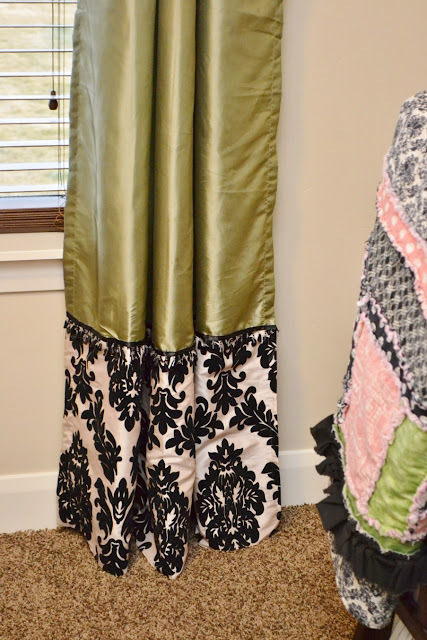 You will need to make sure that you leave an inch or so overhang on each side of your curtain with the new fabric so that you can fold it over and sew it onto the curtain panel. Next fold over your bottom of your new fabric and sew it over just a 1/4 of an inch to hide the serged edge. If you don't have a serger fold the fabric over once and sew it and then fold it over again and sew it. That way you won't see the raw edge at all. Next fold over your extra inch on each of the sides and sew it down onto the curtain. If you have enough you can fold some of the extra under and then sew and then you wouldn't see the seam from your serger. If you don't have a serger then fold it under twice so that you don't see the raw edge. Last to add the embellishment trim to your curtain you can pin it into place right on top of your seam, or just eyeball it and sew it into place. A note about trims: some regular sewing machines can't handle the thick braided trims so be careful when sewing them onto your curtains. Before I got my industrial machine I tried to stick to the skinnier trims or glued them into place using heavy duty upholstery fabric glue. Don't you just love how they turned out? I love that I was able to get custom designer style curtains for around $12/panel. Perfect for my budget and my expensive tastes! How cute!! Thanks for linking up for Pinterest Tuesday! 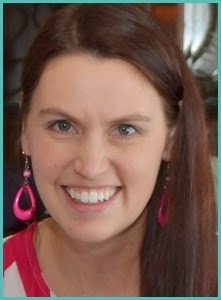 Could you help me get the word out about my link party by either linking back to me in your post or putting the button on your blog?